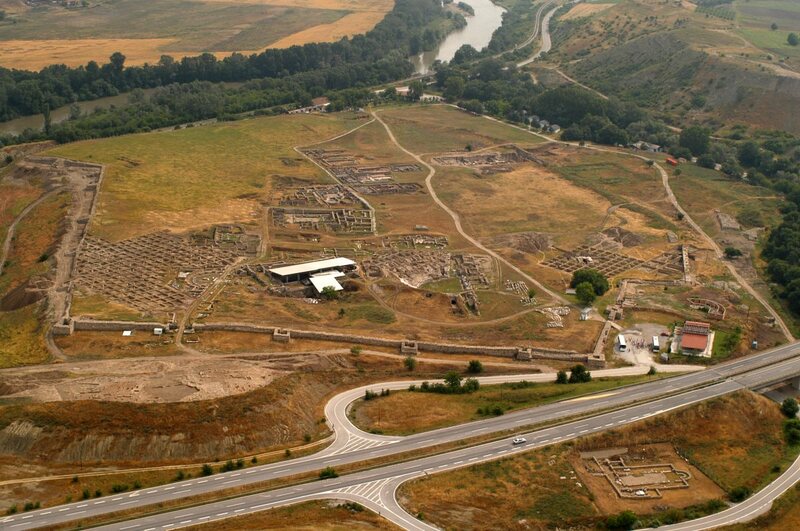 The remains of Stobi are located on the river Vardar and as considered by many explorers and travellers, this is the biggest and the most famous archaeological site in the Republic of Macedonia. Located in the heart of Macedonia, on the crossroads between the Aegean World and the Central Balkan, during the whole period of its existence it was a place where cultural achievements of the ancient world gathered in a unique way. Today, the remains of this famous archaeological site are equally easily approachable from the E-75 corridor of the international highway, thus making it very popular tourist destination in Macedonia. The nocturnal illumination of the city walls and preserved monuments, additionally emphasize its beauty and attractiveness. The ancient town of Stobi was mentioned for the first time in 197 B.C., but the beginnings of the town can be traced back at least 400 years earlier and also there are traces from prehistory in the vicinity. The old city of Stobi “…Stobis, vetus urbs…”, as the Roman historian Livy named it, at the confluence of rivers Crna and Vardar, was the largest city in the northern part of the Roman province Macedonia, later capital city of the Roman province of Macedonia - Secunda, an important urban, military, administrative, trade and religious center of two large empires: the Roman and Early Byzantine. The preserved buildings of the town include a theater built in the 2nd century A.D., luxurious palaces with fountains and mosaics, as well as church buildings of the basilica type with floor mosaics, wall mosaics and fresco-paintings. The Partenius' palace, where Emperor Teodosius was a guest in 388 A.D. and the Peristerius and Partinius palaces are also of exceptional beauty. The House of the Psalms – This house is also known as the House of the Psalms due to the mosaic floor divided in a couple of zones, of which the most significant of all is the zone where psalm 42 is illustrated. Probably the house was erected in the 2ndcentury during the period of the Synagogue and in the beginning it was used for that purpose. The Large bath - The Bath consist of three rooms: apoditerium (a dressing room), frigidarium (a room with cold water) and the caldarium (a room with hot air). The caldarium has an apse on the eastern side and five praefurnia (fireplaces) on the outside. The Large Bath was built at the end of the 3rd century AD. The House of Peristerius - This was a large living complex for several families and had shops. The central part is a courtyard, in the eastern part there are floor mosaics and in the middle there is a marble fountain. The complex dated between 4th and 5thcentury. The Theodosian Palace - The most representative residential building in Stobi is located in the center of the town, between the streets of Via Principalis Inferior and Via Principalis Superior. The name was applied by the assumption that the emperor Theodosius I was accommodated here during his visit of Stobi in 388 AD. The streets - A few streets that intersected the city were discovered in Stobi: the Sacra, Via Principalis Superior and Via Principalis Inferior, Via Theodosia and Via Axia. Some of the streets are still covered with sandstone slabs. The Building with arches (the Roman forum) - This object was erected in the 1st or 2nd century AD. It has a rectangular plan with two apsidal halls on the western side. The walls are made of tiles and stone with massive pilasters connected by arches. It is still not completely excavated, and was probably located close to the town’s forum. The Theater - The first phase of this object dates from the end of the 1st century and in the middle of the 2nd century the theatre construction was restarted, with a different concept. The seats were grouped in 33 – 35 rows, divided in two zones and calculations suggest the auditorium could have accepted 7 600 spectators. The fortress of Vinica is the most important archaeological site in the city. The whole depot of famous Early Christian Terracotta icons was discovered at this site in 1985/86, during the archaeological excavations. These terracotta relieves date from 6th and 7thand they were made in a mould placing technique in two different sizes. The most famous icon, is the icon of the first called Apostle Andrew, which is the oldest terracotta icon in Europe, dating back from the 3rd century. The original artefacts are displayed in the city museum, where it is possible to buy commercial copies of the icons. 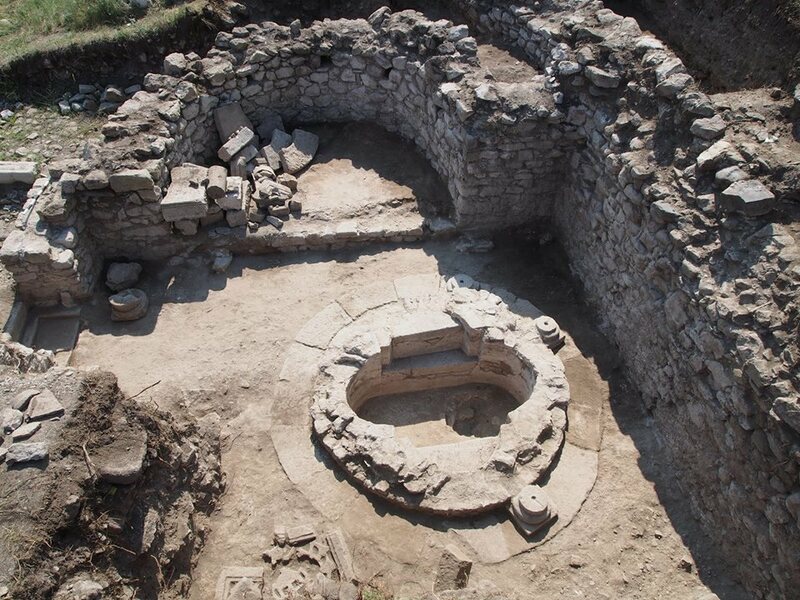 The archaeological site settled in the center of the city in one of its phases witnesses the situation and state of Strumica in the Late Ancient period. A complex of ecclesiastical buildings was unearthed on the site, in the center of which there is a big vaulted tomb. The churches were constructed above the older church, an Early Christian basilica with the floor decorated with a polychrome mosaic. The original church dedicated to the Fifteen Tiberiopolis Martyrs contains fresco portray of the faces of the 15 martyrs, and it is the oldest discovered fresco in Macedonia dating from 9thor beginning of 10th century. The archaeological site around Kocani located in the village of Morodvis, 7km south of the city. It is known as a great religious center from the 5th and 6th century, especially in the time of Tzar Samuil, in 10th century. The ruins of four early Roman Christian basilicas have been found on the site, as well as about 80 necropolises (tombs). Archaeological excavations also discovered remnants of four churches, some of them dating from the 5th century. 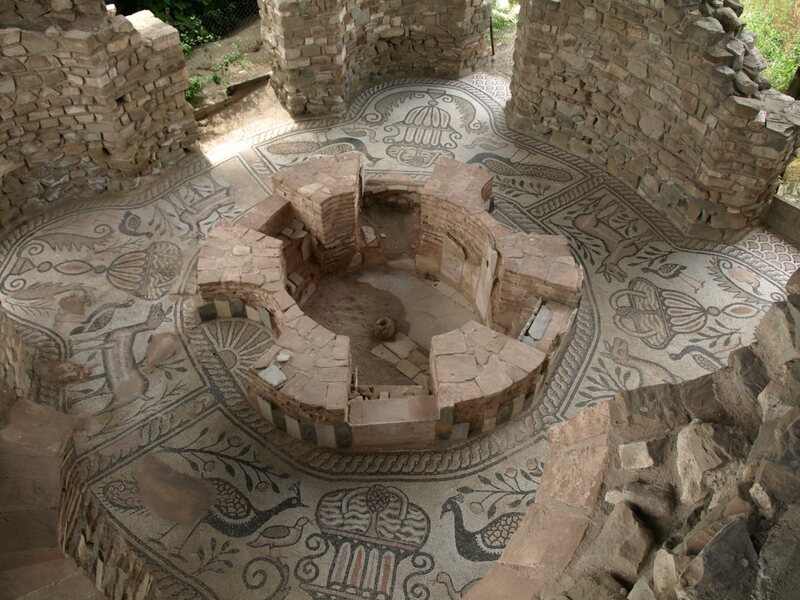 Konjuh is the archaeological site from the Early Christian period, with the remains of an unusual early Byzantine church in the form of a Rotunda (oval church). The Rotunda probably dates back to the 6th century, during the reign of Emperor Justinian I. According to dimension it is presumed that the rotunda was a central temple of some big and magnificent ancient city.